If you’re one of the millions of adults with missing teeth, you understand how this situation affects far more than your smile. Without proper treatment, even a single missing tooth can cause serious complications. While many feel the only way to treat missing teeth is through dentures, there may be another option. Crown and bridges offer both visual and functional restoration by strengthening a weakened tooth and improving its appearance. But what is the difference between a crown and a bridge? While often used together when multiple teeth are missing, let’s explore the differences and benefits of a dental crown and bridge. 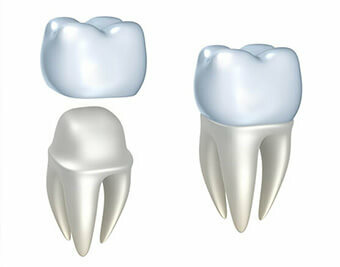 In essence, a dental crown works as a cover for a failing tooth. Whether your tooth is fractured, misshapen or undergone treatment, such as a root canal, crowns add strength and stability to a damaged tooth. When crowns first entered the market years ago, technology was limited and matching it to teeth shape and colour was often underwhelming. With our current abilities, crowns are customized to closely resemble surrounding teeth. Metal | Primarily used for molars, metal crowns offer extreme durability. Made out of either alloys with high concentrations of platinum or gold or base-alloys, they can withstand the intense pressures of chewing. Known for its long lifespan, metal crowns are least likely to break or chip. Because of its obvious metal appearance, they’re often reserved for out-of-sight teeth. Stainless Steel | Typically used as a temporary covering, stainless steel crowns are often recommended to cover teeth while their permanent crown is being made. This is a common crown for children when covering missing or damaged baby teeth. Porcelain and Metal | Offers the durability of metal crowns without the metal appearance. The porcelain is color-matched to your surrounding teeth and then fused to the metal. Generally, porcelain and metal crowns are used for highly-visible teeth or when a bridge requires the strength of metal. Resin | This is the most cost-effective option, and due to its materials often reveals a natural looking tooth in both texture and coloration. Those on a budget who wish to retain the natural appearance of their teeth find resin crowns to be an optimum choice. Ceramic or Porcelain | Manufactured completely out of its primary material, these crowns offer the greatest in colour-matching and are recommended for patients with metal allergies. Fundamentally, a dental bridge is no different than a roadway bridge. Think of your mouth as a rolling countryside and your missing teeth as a river. To cross the river, you must build a bridge. Much like a roadway bridge, a dental bridge is anchored to teeth on each side of the gap. These supports, also known as abutments, are secured to your natural teeth or to dental crowns. For many of our patients, a dental bridge provides restoration to appearance and functionality. Cosmetically, a bridge helps retain your natural face shape, which often alters when multiple teeth go missing. Bridges also distribute chewing pressure to relieve jaw pain and prevents your remaining teeth from shifting. Traditional Bridge | Recommended when your missing teeth are bordered by your natural teeth. Considered the cornerstone in dental bridges, traditional bridges are extremely durable, which is why it’s commonly used to replace molars. The two supporting teeth are filed down and covered with a crown. The bridge is made out of ceramics or porcelain fused metal. Cantilever Bridge | Should you only have one side with adjacent teeth, a cantilever bridge may be used. While the abutment is only on one side of the bridge, this type of bridge still offers excellent support and longevity. Maryland Bridge or Resin-Bonded Bridge | While similar to the traditional bridge, this bridge is anchored by bonding porcelain or metal “wings” to existing teeth. The framework is often made out of porcelain or metal. You don’t have to live with the challenges, frustrations and embarrassment of missing teeth. While you may feel life will never be the same, our compassionate staff of dentistry professionals are here to prove otherwise. Reclaiming your happiness and vitality is possible through our innovative dental procedures. Whether you’re dealing with a fractured tooth or missing teeth, contact us today at (03) 8595 2632 and let’s work together for real, lasting restoration.